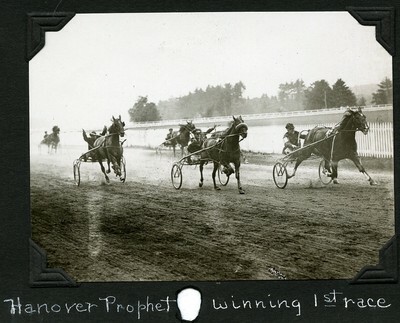 Black and white action photograph of the first heat of the Classified One Mile Pace at Cedar Lake Park, Sturbridge, Massachusetts. The top three finishers in the heat are Hanover Prophet in first place, Gloria Hanover showing in second, and Highland Worthy placing in third. Hollyrood Rush can be seen in the fourth place slot in the back ground with Still Waters in fifth. Not seen in the photo, Walter Princeton, in sixth.